How do you know you’ve got a quality concrete product? If you’re investing in a concrete floor, you want to make sure you’re getting a high quality product. The last thing you want is to have to carry out costly repairs that might disrupt your business because you used an inferior concrete product. One way of assuring quality is to look for quality standard marks. The ‘European Standard EN13 813 for Screed materials and floor screeds – Screed Material – properties and requirements’ sets out international specifications for the performance of screed materials used for internal floor construction. It includes performance levels for hardened screed materials including compressive strength, flexural strength and resistance to wear. 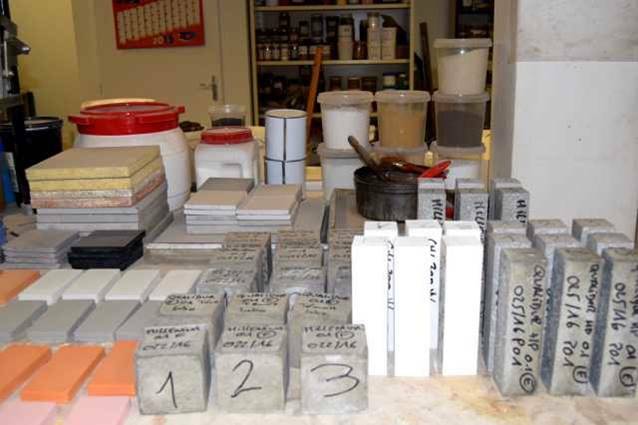 At the Rocland laboratory in Fleury, France, we carry out around 135 tests per year on new and existing concrete products to ensure the highest quality. As well as monitoring compressive strength, flexural strength and resistance to wear, we also examine concrete setting times and shrinkage. Tests are carried out on behalf of our production subsidiaries in Spain, South Africa and India as well as on products from any new aggregate suppliers to reduce the risk of product substitution. 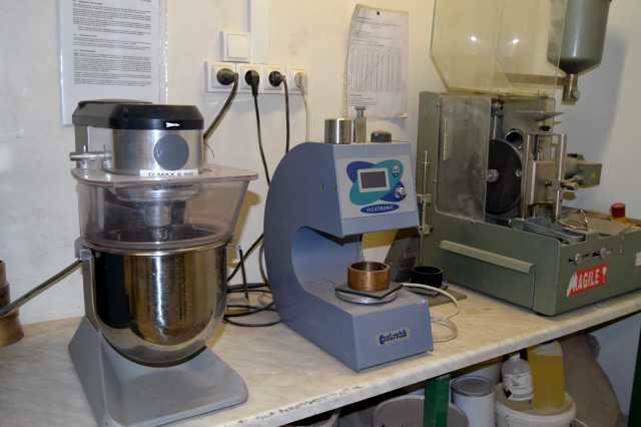 The two staff at our Fleury laboratory also test raw materials from other RCR production companies and analyse products from our competitors. We use a fresh sample for each test. 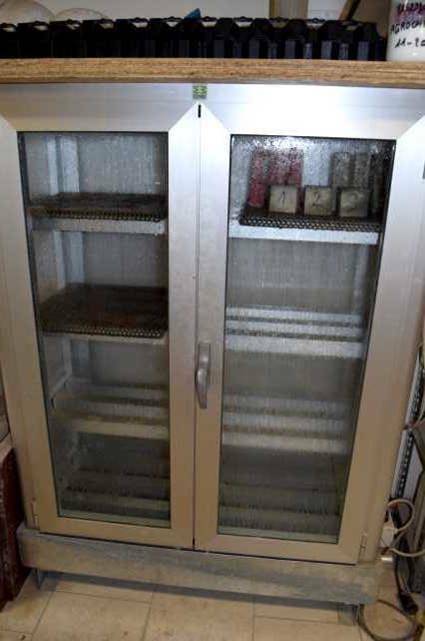 The integrity of the samples is maintained by storing them in a wet preservation cupboard, which ensures the samples are kept at consistent air and humidity levels. 1. 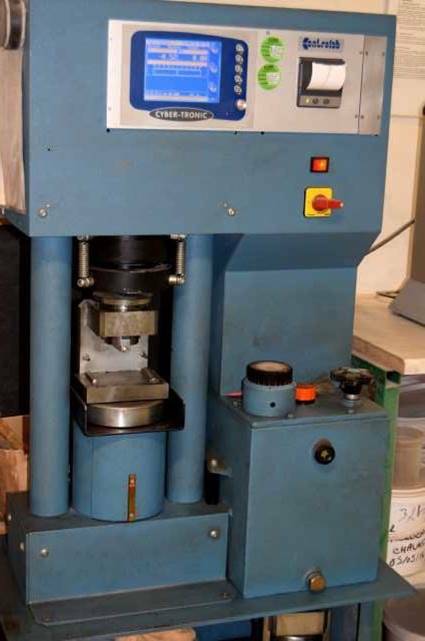 Our Press tests flexural and compressive strength. 2. 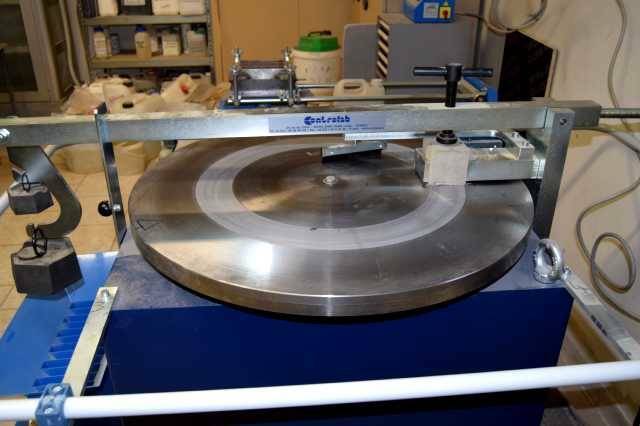 Testing for abrasion resistance is incredibly important. 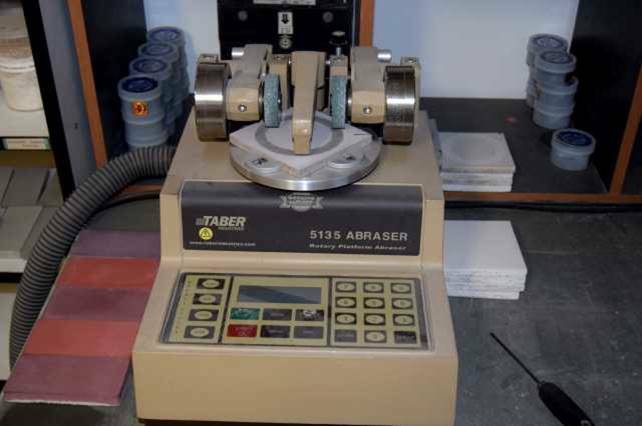 We use a Taber Abraser to perform accelerated wear testing. 3. 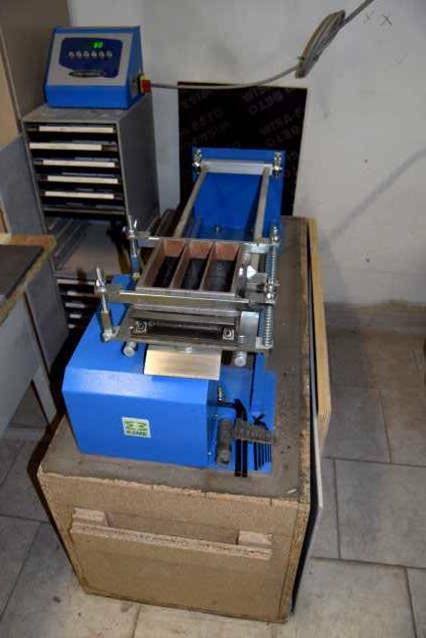 Another machine used to evaluate abrasion resistance is the Bohme equipment where samples are clamped and subjected to wear from a grinding wheel. 4. We also use a shake table to test concrete density. 5. 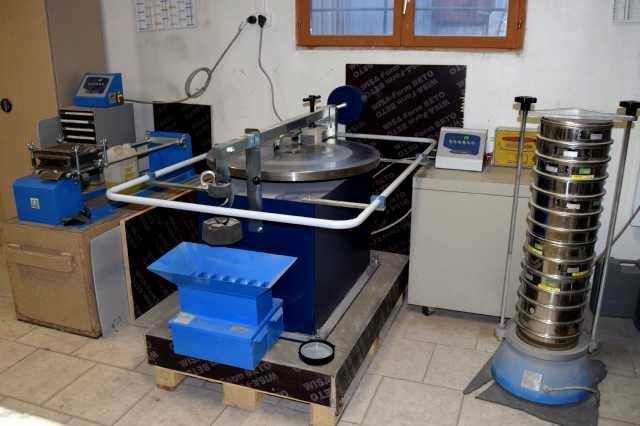 Next to the shake table and the Bohme machine is our sieving equipment, which is used to analyse the particle sizes of aggregate. 6. As well as carrying out compulsory tests to ensure we adhere to European Standards, we also analyse additional features, such as setting time, where we measure the cycle of setting for cement and mortar paste. This is our mixer and setting time station. 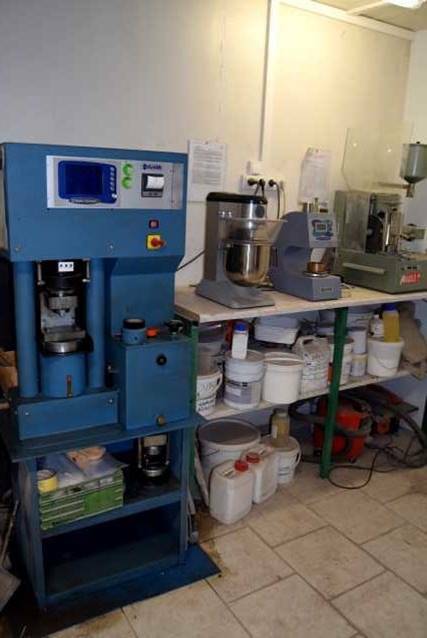 Once we have conducted the tests, the results are used to enable us to develop new gradings, evolve comparable raw materials, create new pigments and to fabricate alternative components. 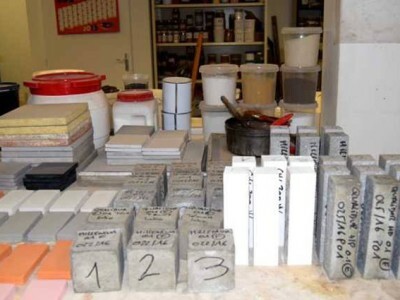 As well as ensuring we continue to supply high quality products that conform to European Standard EN 13 813, conducting thousands of tests means we are able to design bespoke cementitious formulae for private label customers. Rocland manufactures a range of dry shake concrete surface hardeners, screeds, admixtures and curing and sealing agents. Find out more about our range of surface hardener products here. Copyright © 2014 - All Right Reserved - ROCLAND.